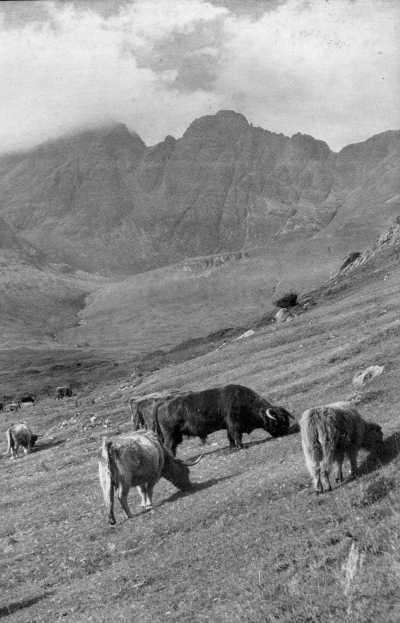 AGRICULTURE in the crofts, the Islands, and West Highlands presents special problems. In this book Dr Fraser Darling explains the principles of putting land into good heart and of growing crops which suit the difficult climate and conditions. There is no one better qualified to do this than Dr Fraser Darling, who has first-hand experience and a great sympathy with the crofter's problem. Some of Mr Robert Adams's beautiful photographs of Highland scenery illustrate the book, and this selection shows that he does not neglect to record the arts and crafts of Highland Life. The blood of the Highland breed is of great value in the store stock exported from the Highlands, but unfortunately it is generally felt that to maintain pure bred Highlanders does not pay. There cannot be a continuation of cross-Highland cattle for the store markets unless someone keeps pure Highlanders. A well-ordered cattle policy should ensure the maintenance of sufficient pure Highland cattle, should attempt to keep the Shorthorn-Highland cross heifers in the crofting districts, and, in allowing these heifers to be crossed with an Aberdeen-Angus bull, should use persuasion to prevent the black offspring being kept as breeding stock in the West. These black-polled calves, which would be one-half A.A., one-quarter Shorthorn and one-quarter Highland, should be reared to be six-quarter stirks and then sold out of the Highlands or grazed off as the end-product. The Highlanders in this photograph are grazing old crofting lands which were once cultivated. A 1977 BBC Bristol production for The World About Us series captures a vanished world of crofting in the Outer Hebrides. Written and narrated by Finlay J. Macdonald, filmed and directed by Alan McGregor with help from the RSPB Film Unit. Macdonald, a native Gaelic speaker, was from the nearby island of Harris. This book is the result of an experiment in agricultural journalism. When a series of articles first took shape in my mind as an accompaniment to personal travels in the crofting areas, I knew that its success would not be wholly dependent on such knowledge, and ability to impart it, as I might possess. The fortunes of the weekly articles would depend largely on the co-operation of the Highland newspaper editors: with their paper supplies being cut and increasing official demands being made on their space, would they be prepared to print an additional 600 to 700 words? Every editor resident in the Highlands who was approached replied that he would do his best, and that he has done. The weekly articles still could not be called a success unless it was known that they were widely read. The crofter's readiness to read them was just as important as my willingness to write and the editor's kindness and public spirit in printing them. I believed that the crofter would read matter which dealt with the problems of his own husbandry. It did not matter to me whether he agreed or not with what I had to say, but I believed he would preserve an open mind and bring his critical sense to bear. The footnote each week inviting correspondence on crofting agriculture was in some measure a safeguard that I should not do all the talking! The West Highlands are a country of difficult communications and on a part-time appointment it would have been impossible for me to see every crofter personally and have a crack with him—the more's the pity, from my point of view. The weekly article helped me to say something about basic principles of agriculture, and the crofter's response in letters asking for advice is an expression of goodwill and a definite sign that someone wants to know. The volume of letters from crofters has steadily grown, and if the truth be known, these letters are the only ones I sit down to answer with enthusiasm and enjoyment, instead of as an irksome necessity. I was criticized recently for saying that there was defeatism in the Highlands, defeatism being the failure to believe that the croft was worth working for a living or part of a living. Such an attitude undoubtedly exists, but my remark should never have been represented as my final opinion of the crofter. I have faith in him and in the crofting life as the good life; the interest shown in these articles and the letters I receive asking for particular information are proof that defeatism is not general. While people can take the trouble to sit down with pen and paper and ask for knowledge, they are not taking the line of least resistance, which is the attitude of defeatism. These letters are a token of a positive will to action and I miss no opportunity of telling that to the outside world. Many correspondents have asked if the articles might be gathered together in book form. The idea seemed a good one, and I am glad to present them in that form now in an expanded version, thanks to the co-operation of the Publishers. I am also grateful for the opportunity of having Mr Robert M. Adam's illustrations. His beautiful photographs of Highland scenery are famous, but the selection given with this book shows that he does not neglect to record the arts and crafts of Highland folk. These photographs have enabled me to add a last few words to the book in such fashion as the reader and I might talk if we were walking round the croft together. Made in 1934 by an amateur ethnographer and aristocratic German diplomat who had abandoned his country to live in Scotland, this is one of the earliest film portraits of the tiny island Eriskay, famous for Whiskey Galore, the Eriskay Love Lilt, the Eriskay fisherman's jersey, and the fact that Bonnie Prince Charlie first set foot on Scottish soil on this island, when he returned from France to lead the rebellion. 1. What is "Good Heart"? Crofting's New Voices from Scottish Crofting Federation on Vimeo. The plans and dreams of a new generation from the land. They value their connections to the land; they want to work the land and make their homes there. But against them stands the market economy: unaffordable land and housing, and a lack of employment opportunities in the rural communities they love. A group gathers in the northern Highlands to organise for change. Meet the new generation of young crofters. There are many Crofting pages on Facebook and while this selection is correct at time of listing these I can't guarantee they will still be there when you try them. Film of my father in-law. Malcolm Macleod of Laxay, Isle of Lewis. His nickname "Chaidh Ardie" is a childhood abbreviation of his name in Gaelic - Malcolm son of Angus son of Alasdair. The film was made by John Murdo Macdonald. Machair is the Gaelic name for a rare and distinct type of coastal grassland that supports a huge diversity of wildlife in the Hebrides of Scotland. This is the story of crofting on the machair in the 21st century and a partnership project to support this unique landscape.